The beginning of the trading day on the Moscow Exchange saw the ruble tumbling, trading at 55.1 against the dollar and 62.6 against the euro – its lowest levels since April 7. 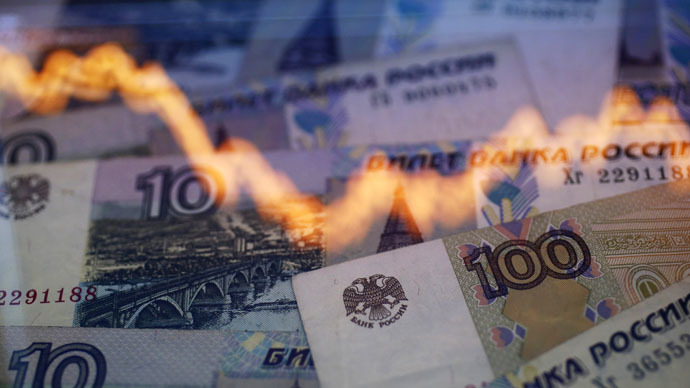 Falling oil and renewed shelling in Donbass are the key factors behind the ruble’s slide, experts say. The ruble has lost more than 4 percent this week as OPEC member states are expected to keep oil output quota unchanged – at 30 million barrels a day – at a landmark meeting Friday. Brent crude is trading at $64.19 per barrel, nearly 3 percent less than two days ago. The value of the euro is rising amid growing expectations that Greece will soon put an end to five months of talks and capitulate to its international creditors over its multibillion euro debt. Greece and the troika of international lenders, the IMF, the ECB and the European Commission, expect to reach a debt agreement within days, if not hours, French President Francois Hollande said Wednesday. The Russian currency lost about a half of its value against the dollar in 2014, with the sharp drop in crude prices and Western sanctions being the key factors. In an attempt to stop the slump, the Central Bank decided to free-float the ruble by abolishing the dual currency soft peg in November. The decision didn’t have an immediate effect, as the ruble remained very volatile till the end of 2014. On December 16, the rublehit rock bottom, losing more than 20 percent, with one dollar buying 80 rubles. Last week, German Gref, the CEO of Sberbank, Russia’s largest bank, said the events that resulted in a record-high $6 billion bank run were a planned attack on Russia. This year has seen rublebecomingthe world’s best performing currency, but this fortnight’s trend could see the end of the ruble’s remarkable surge. The Central Bank has recently renewed its currency buying, saying it was trying to restore Russian international reserves that have shrunk by a quarter in 12 months to stand at $360.5 billion. Russia’s monetary authorities and experts agree that the ruble has become less dependent on oil fluctuations. Last week Russian Finance Minister Anton Siluanov said the country has gotten rid of the excessive dependence on oil known as Dutch disease.